We offer good quality pipe taps to our customers. - Made from carbon steel in right hand configuration only. - These taps are especially suited for restricted area work. - All taps have taper of 3/4" per foot. - Marked with drill size for pilot hole. We are among the reputed organizations, deeply engaged in offering an optimum quality range of 3/4" Pipe Tap. We are engaged in dealing high quality of pipe taps. We are well-known across the market for our high quality of HSS Ground Thread Taper Pipe Taps. These products are high in strength and seamless in finish. 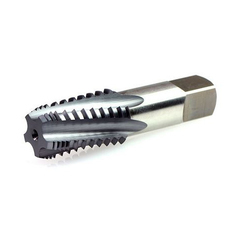 Rose bits are used for milting out any steel stuck in a drill hole such as rods, casing, corebarrels, etc. Manufactured from a special alloy tool steel and carefully heat treated. Rose bits connect to the reaming shell of a corebarrel.